Mid-spring through mid-summer is a good time to see our native orchids in flower here in Ohio. One of the showiest groups is the Lady’s Slippers, which have a distinctive pouch-shaped lip. 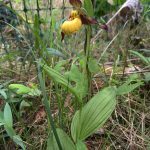 We have four species of Lady’s Slippers (Cypripedium) in Ohio and one of the more frequent ones is the Yellow Lady’s Slipper (C. parviflorum). 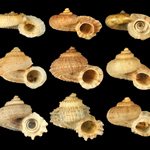 There are two varieties of this species – Large and Small. The Large (var. pubescens) tends to be a plant of rich woods in more upland situations, while the Small (var. 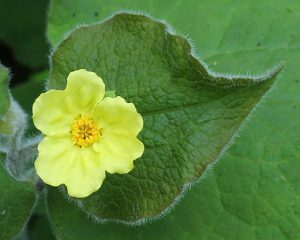 parviflorum) is a plant of wet and often more open situations. 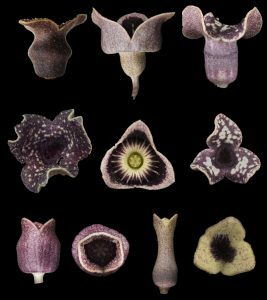 In addition, there are floral differences, including overall flower size and coloration of petals. In many places they are quite distinct, but in others there seem to be intermediates, which is the main reason that they are not called distinct species. The Small Yellow Lady’s Slipper in flower at Cedar Bog. The Small Yellow is the less common one in Ohio, given that there are fewer instances of its habitat than for the Large. One place that the Small occurs is Cedar Bog in Champaign County. Cedar Bog is really less of a “bog” and more of a “fen” or swamp, because it is not a lake that has been filled in with Sphagnum moss, creating an acidic habitat, but is rather an alkaline wetland that has water flowing through it. Cedar Bog is owned by the Ohio History Connection and the Ohio Department of Natural Resources. 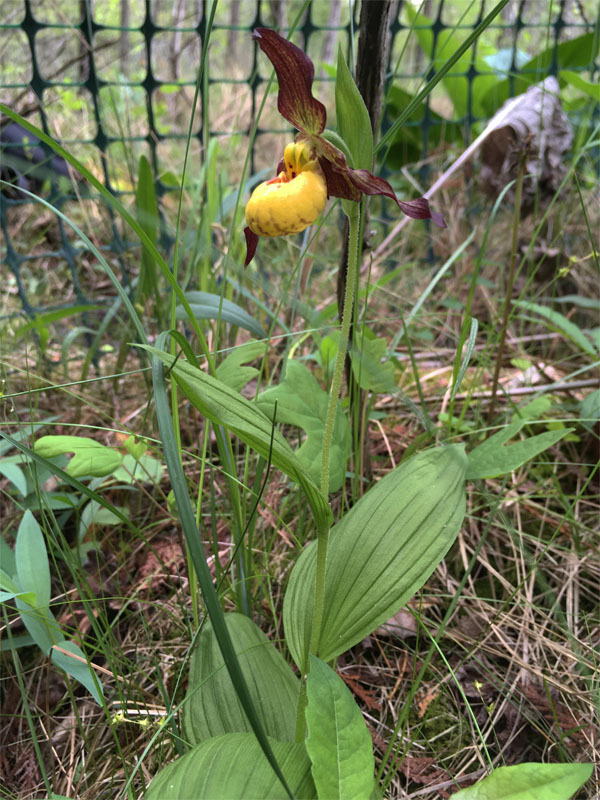 Unfortunately, the numbers of Small Yellow Lady’s Slippers at Cedar Bog have been declining recently, so the preserve managers wanted to have the flowers hand-pollinated to increase the changes of seed set, rather than depending on bees to do the job. They called on me as an orchid specialist to perform the pollination, since orchids have a rather specialized floral morphology. Two weeks ago my colleague, Richard Gardner, from the ODNR Division of Natural Areas and Preserves, picked me up and we headed out to Cedar Bog. Once there, we put on rubber boots because we needed to hike off the boardwalk to the orchids. 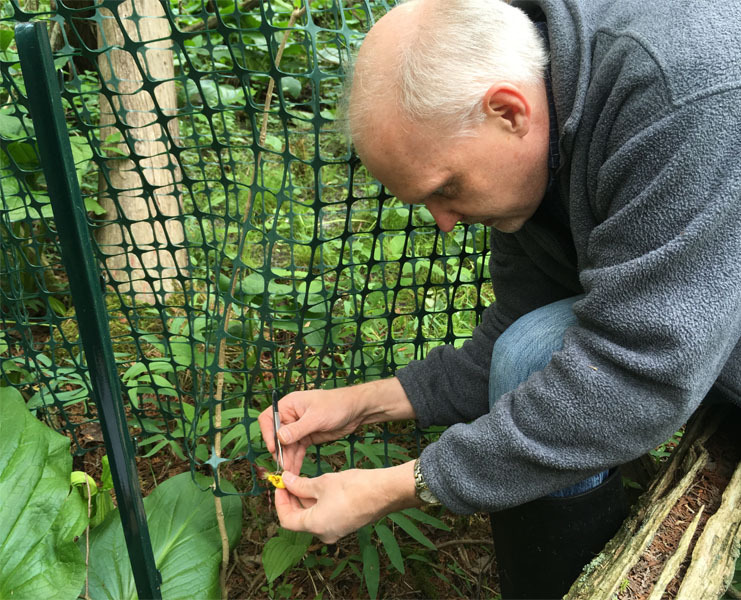 We made our way to the plants, which had been surrounded by plastic fencing to keep the deer from browsing them. We opened the enclosures and I set to pollinating, removing the pollen masses (pollinia) from one plant with forceps and transferring them to another. There were only five stems up this year, and only three of those were in flower, so each pollinium was fairly precious. I did my best, but we won’t know for a few weeks if the pollination was successful – hopefully we will soon see capsules beginning to swell that will be filled with mature seeds by the end of the summer. You can learn more about Cedar Bog at this website. 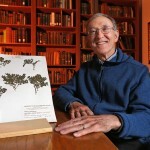 About the Author: Dr. John Freudenstein is Director of the OSU Herbarium and Professor of EEOB. Photographs by Richard Gardner. 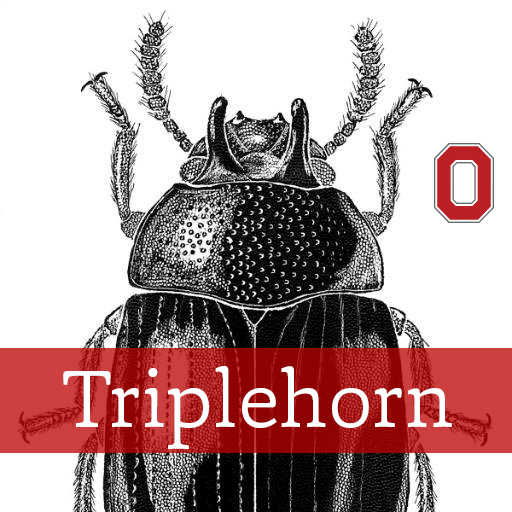 Today we introduce type specimens kept in The Ohio State University Herbarium. But first let us briefly introduce the herbarium and what a type specimen of a plant is. The Ohio State University Herbarium was established in 1891, 21 years after the founding of the university. Since its inception, the vascular plant collections [all seed-bearing plants and ferns], as well as the non-vascular plant collections [mosses and liverworts], have grown rapidly through the efforts of the many plant collectors from Ohio and beyond, and through gifts, exchanges and purchases. The total holdings of vascular plants are estimated at over 550,000 specimens. The collection, having been built up over a period of nearly 126 years, is a state treasure. 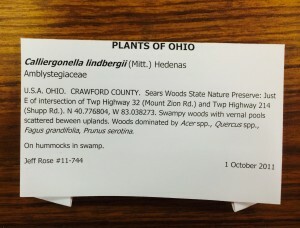 It continues to be augmented and studied by many experts interested in various groups of plants as well as in some aspects of Ohio vegetation. The herbarium preserves specimens as vouchers to document past and present research studies on vegetation. Such documentation may increase the value of the research study by making it possible for future workers to determine, without any doubt, what plants were used in the original research. 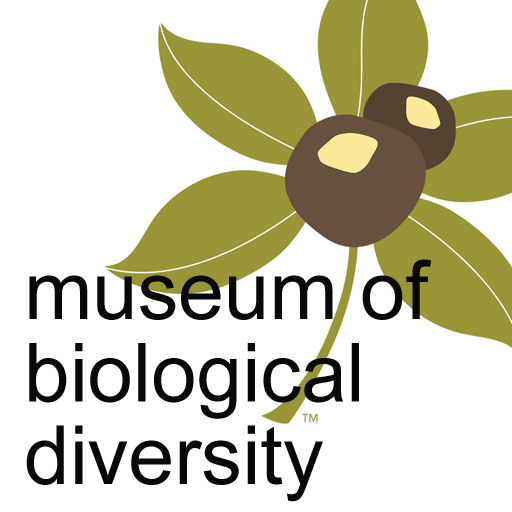 An important special case of this is the preservation of specimens of the original plant material that was used to describe and give a name to a new species or sub-specific entity. These are called type specimens and are often simply called “types”. They are specimens on which the naming of plants and plant populations (as variety or subspecies) are based, and in a sense they serve as the key to the name of a plant. 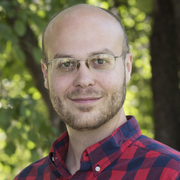 In the event of any discrepancy between independent descriptions of a species or any element of it, now or in the past, researchers can go back to the type specimen, and clarify the matter. For this reason, type specimens are among the most valuable entities in any collection, including the OSU herbarium. 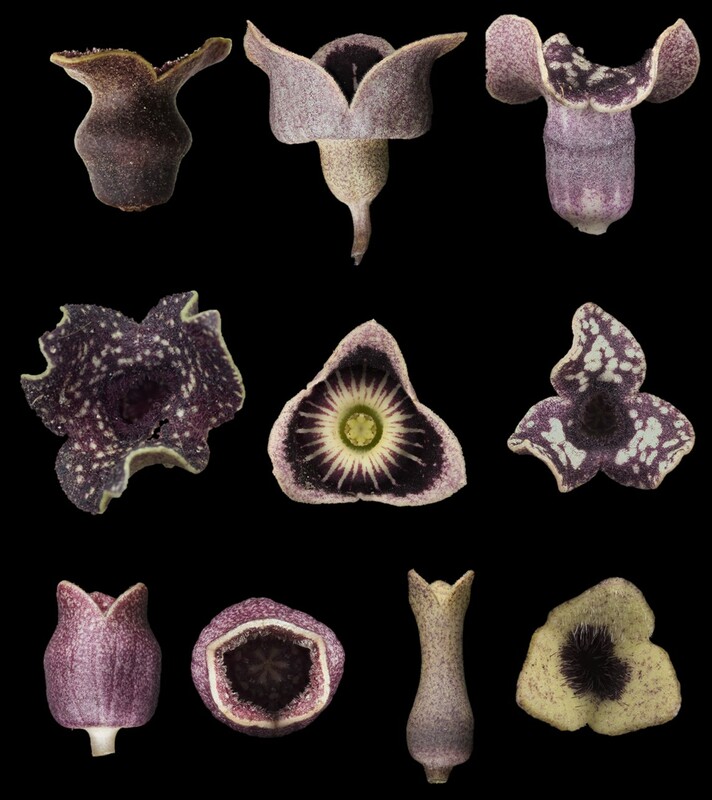 The effort is to have only a single type specimen for each name associated with a plant or its population, although in the past, that is, before the adoption of the type concept, many specimens were often used to describe and name a particular plant species. An envelope containing reference literature about the type specimen. Cover of a file of a type specimen. A type specimen inside the file. A type specimen from Ohio. Because of their value, type specimens are given special care by curators of herbaria. Since a while back an active search has been conducted to find and remove type specimens from the OSU collection for storage in a special cabinet (see photo). Currently over 470 sheets representing more than 100 vascular plant taxa have been confirmed as type specimens and photographs of types in our collection. Type specimens along with type photographs are, therefore, treasures of all times. Their preservation and safety is one of the priorities in the herbarium. Type specimens are kept in a separate and special case. This precludes unnecessary handling and permits more adequate inspection for possible harm (e.g. insect infestation). 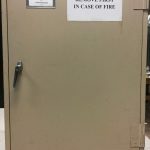 The case containing type specimens is placed on a wheeled cart with a sign “TYPE COLLECTION REMOVE FIRST IN CASE OF FIRE” consequently it’s easy to take it out first or quickly, during an emergency. Open Case with files containing type specimens. A greater and more tragic loss of literally thousands of type specimens resulted from the partial burning of the great herbarium at Berlin, The Federal Republic of Germany, in 1943. Type specimens are not, and should not, be used or handled any more than is necessary. Curators of many herbaria are reluctant to send out type specimens on loan to other botanists or institutions. They insist that researchers must first attempt at establishing identities of their research materials with the help of protologues (all original materials associated with a newly published name, including its description, diagnosis, illustrations, synonyms, studied specimens, etc. ), the original species description, and the available electronic images of many types in databases of institutions and herbaria. It is only after these have failed and that the researcher is in dire need of examining particular details of these types, that they are willing to send types on loan. In our previous post, we illustrated how the type specimen of the Ohio Buckeye was brought, not sent by mail, to Ohio from Berlin. Part of the agreement with the Berlin herbarium then was that it will have to be taken from Berlin and sent back to Berlin with a staff member of the department, thus indicating the level of care that the institution placed on its type collections. 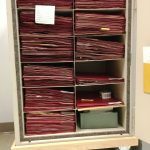 Today, many of the type specimens kept in The Ohio State University Herbarium are available for viewing online through Global Plants, the world’s largest database of digitized plant specimens. Researchers are encouraged to check this and similar websites first in order to examine a type specimen, be it from Ohio or elsewhere. We will show you more samples of type specimens and how researchers make these first descriptions on Friday! About the Authors: Mesfin Tadesse is curator of vascular plants at Ohio State University Herbarium; Azam Abdollahazadeh is a Research Scholar on a short-term visit to the OSU herbarium. In the Adams lab ants are busy tending their fungi gardens. 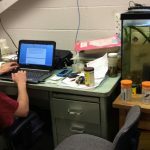 No students are working the day I stop by, but Rachelle Adams, Assistant Professor in the department of Evolution, Ecology & Organismal Biology, is happy to take a break from her computer work and she shows me the ant colonies in her lab. 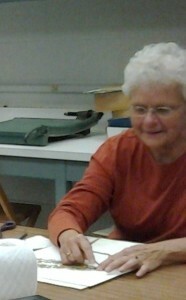 In the Herbarium long-time volunteer Donna Schenk relabels some of the folders that hold the plant specimens. 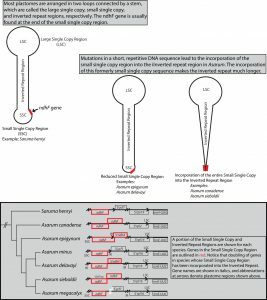 Taxonomy is not static, molecular studies reveal new relationships and classifications are revised. To keep the collection up-to-date and to make it easy to find each specimen we need to keep up with these changes. In the mollusc collection I find Collection Manager Caitlin Byrne working on the computer. Student worker Trevor Smoot sorts through a bag of mussel shells which a researcher donated to the collection. With a big smile Trevor lays out the shells on top of the cabinets, apparently these are some his favorite species. Others will be identified and catalogued later. In the fish collection Sampling Coordinator Brian Zimmerman and Assistant Curator Marc Kibbey both work on their computers. In our previous post, we introduced the story of the Ohio Buckeye, the origin of the term ‘buckeye’, the tree’s scientific name (Aesculus glabra), its relationship with the OSU mascot, Brutus, and how it was introduced to football fans of Ohio in 1987. 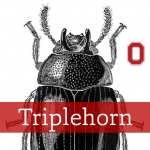 Here, we continue with the story of the buckeye, but with a different focus. We will show how the Ohio Buckeye is both similar and different from other buckeyes, discuss its habitat, flowers, fruits, and how you can grow your own buckeye in your backyard. Currently, there are 13 species of buckeyes in North America, Europe and Asia. Six species are native to the United States. 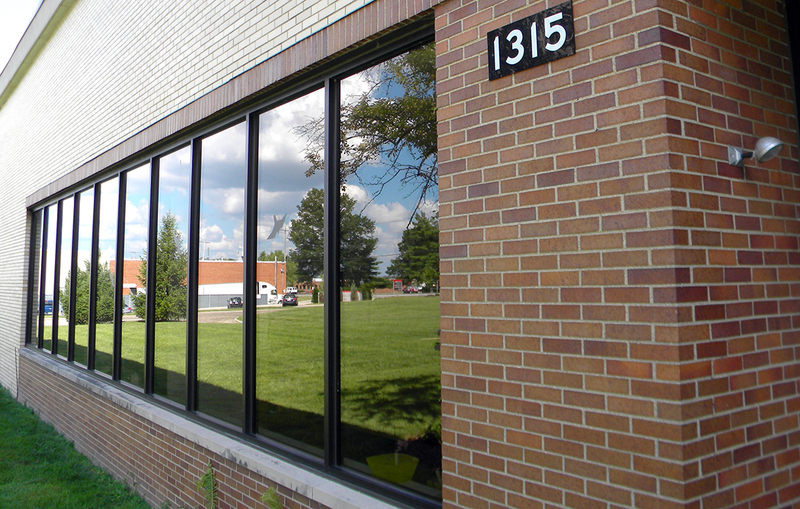 In Ohio you can find two native and several cultivated species. All buckeyes have large compound leaves made up of 5 to 7 leaflets per leaf that radiate from the same point at the end of a leaf stalk. They range from large trees to shrubs. The native species are the Ohio Buckeye (Aesculus glabra) and the Yellow or Sweet Buckeye (Aesculus octandra). 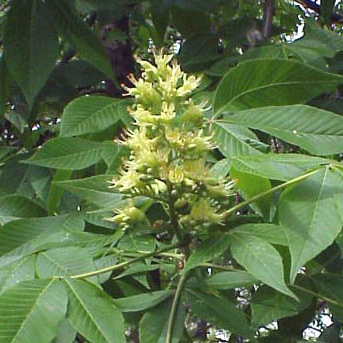 Non-native species cultivated in Ohio include the European Horse Chestnut (Aesculus hippocastanum), and the southeastern US Red Buckeye (Aesculus pavia). 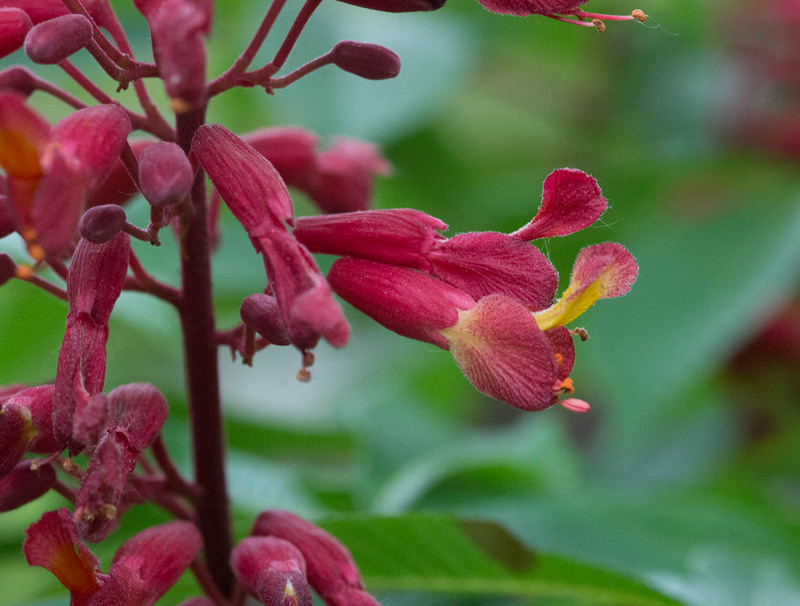 Most species of buckeyes are bee pollinated; the Red Buckeye is hummingbird pollinated and its flowers are red and tubular. The hybrid between the Ohio Buckeye and the Sweet Buckeye, called Maryland Buckeye (Aesculus x marylandica), is also cultivated in Ohio. All buckeyes are found in woodlands and forests of various types, along riverbanks and floodplains. The introduced species and the hybrid plants make attractive trees in lawns, gardens, parks and on roadsides. The flowers are clustered together forming a cone-shaped panicle, a loosely branched inflorescence. They range in color from white (Horse Chestnut), to pale greenish yellow (Ohio Buckeyes), yellow or reddish (Sweet or Yellow Buckeye) to red (Red Buckeye). The fruits are leathery and open from the top when fully mature. 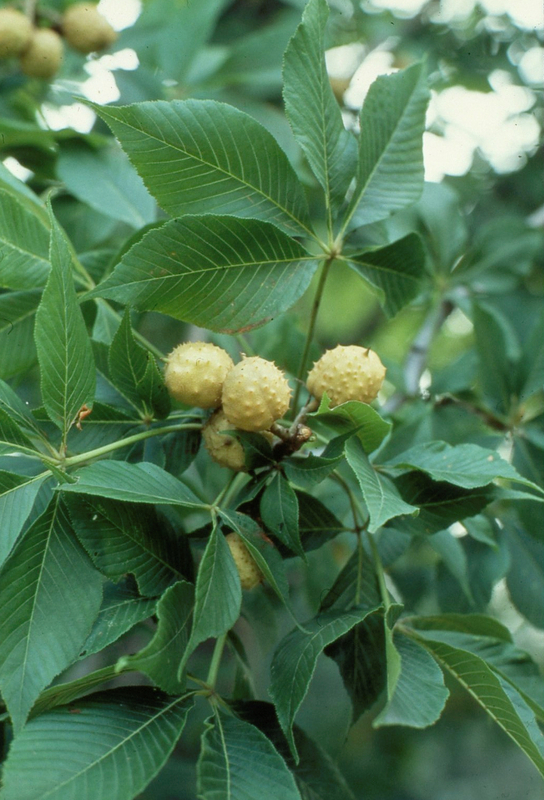 In Ohio Buckeyes and Horse Chestnuts, the fruits are prickly due to short spiny outgrowths while in Sweet Buckeye, they are not. 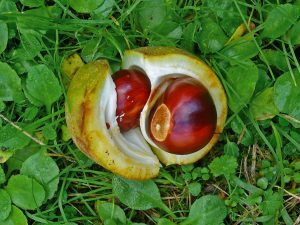 Despite similar fruits, Horse Chestnuts can easily be differentiated from Ohio Buckeyes based on the leaflets, which are mostly 7. In the past, the seeds of the Ohio Buckeye were used as a source of oil for lamps, as an insecticide and as a paste for book binding. The wood was used in making bowls, spoons, handles and boxes. Since the wood is easy to carve, it was also used in making artificial limbs. Extracts from the bark were also used to dye leather. Today, the seeds are carried by some people as a good luck charm and they are treated in much the same way as a four-leafed clover. Some people also associate curative properties to the seeds, particularly for rheumatism. Buckeyes may be cultivated and propagated and can easily be propagated from seeds. Collect the seeds and do not allow them to dry out. Simply place several, fresh seeds, since not all may germinate, in shallow soil, about an inch deep. Gently press the soil down and keep them moist. Some seedlings will develop the next spring. If several seedlings come up, remove all except one so that this will develop into a tree. The seeds require three or more months of cold treatment (34-40 F) for good sprouting. According to records, the Ohio Buckeye is not widely cultivated because “nurseries tend to emphasize the showier horse-chestnut, and perhaps also because of its poisonous properties (a few communities have even enacted ordinances prohibiting its cultivation). However, buckeyes make attractive and interesting landscape plants and are not hard to grow. One disadvantage is that the leaves tend to fall a bit earlier than [those of] other trees, especially in a dry summer, and, of course, the fruits and seeds drop to the ground below after they ripen. But they are not particularly difficult to remove from a lawn”. Cooperrider, T. S., A. W. Cusick, and J. T. Kartesz, (eds. ), 2001. 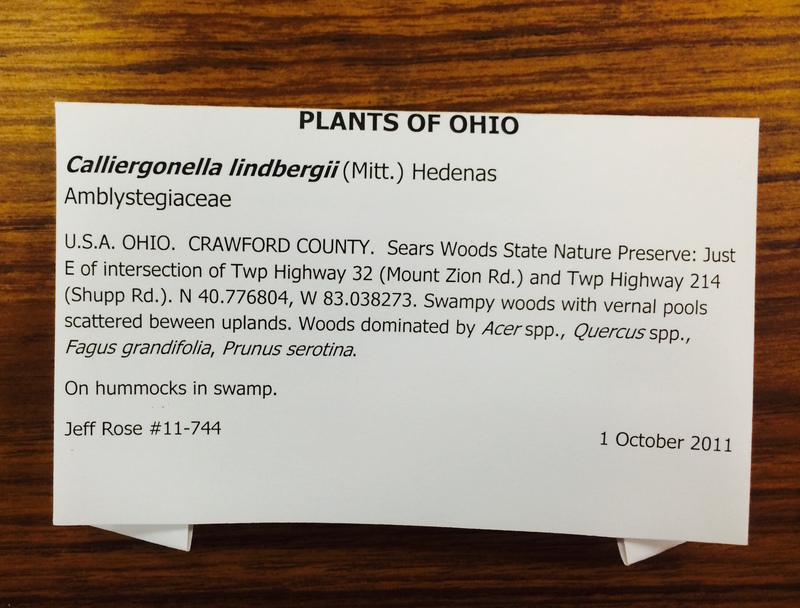 Seventh Catalog of the Vascular Plants of Ohio. Ohio State University Press, Columbus. Furlow, John J. 1991. What is a Buckeye? The Story of the Ohio Buckeye Tree. The Ohio State University Herbarium. Unpublished ms.
Weishaupt, C. G. 1971. Vascular Plants of Ohio. Ed. 3. Kendall/Hunt Publishing Co., Dubuque, Iowa. 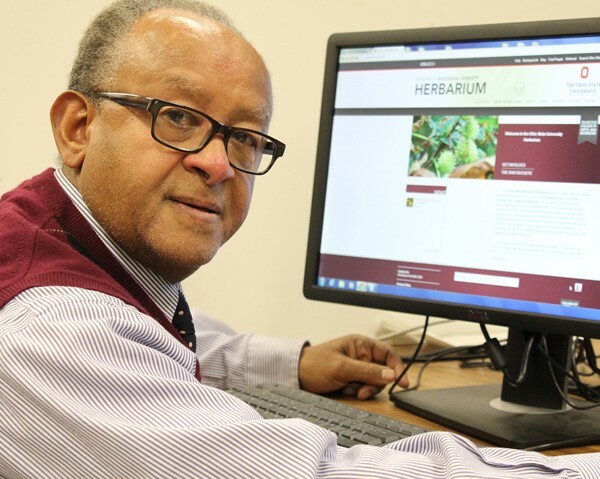 About the Author: Mesfin Tadesse is Curator of Vascular Plants in the OSU Herbarium. During the football season, we are accustomed to seeing Brutus Buckeye dancing on the sidelines, shaking his enlarged head, and helping to stimulate enthusiasm for our team on the gridiron. Opposing teams usually have mascots that are more easily recognizable, such as a lion, or badger, or valiant soldier. What, then, is a buckeye? The term “buckeye” originated from indigenous peoples noticing that European immigrants coming into Ohio had larger eyes, similar to those of the male (buck) deer. The settlers, therefore, were called buckeyes. Seed of the Ohio buckeye. 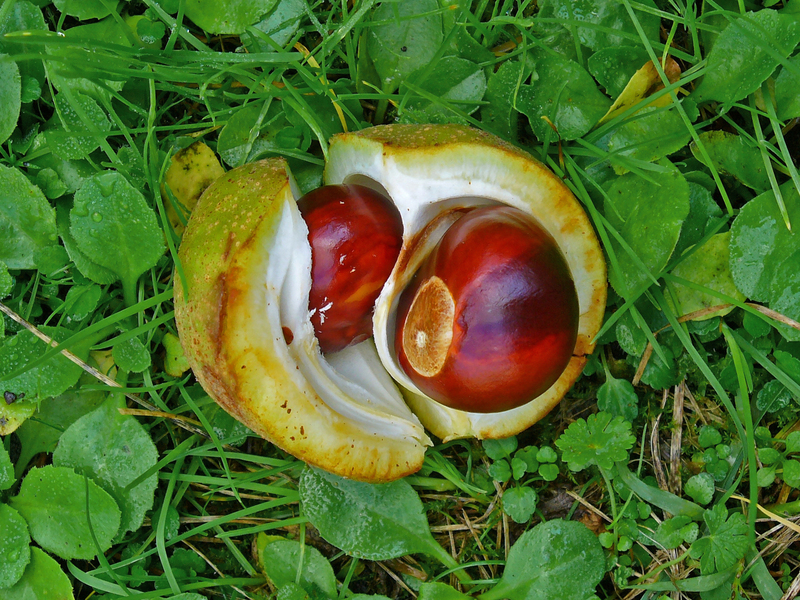 One of the native trees in Ohio, which we now call the Ohio buckeye, has large seeds that also resemble large buck eyes, which led to application of the name as the buckeye tree. This common name was applied to the entire tree and any of its parts. 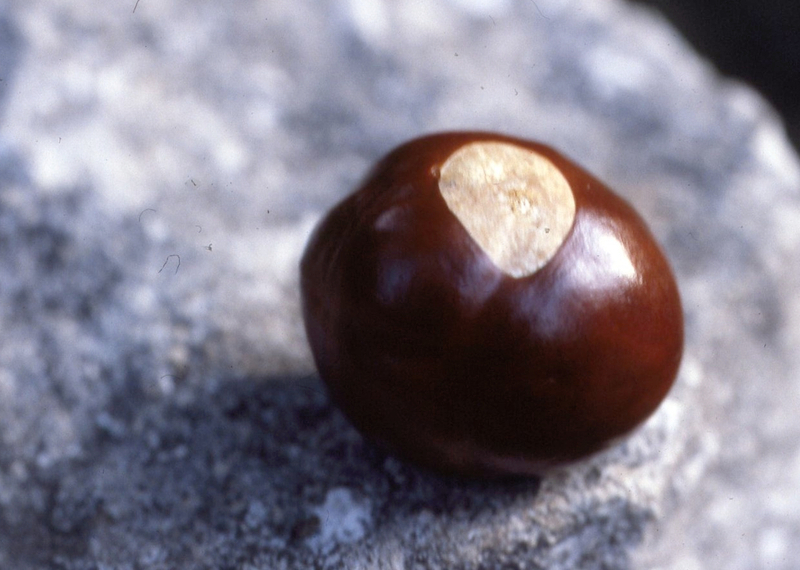 Our mascot, Brutus, represents one seed of the Ohio buckeye tree, attached, obviously, to a human body. This is a most unusual mascot. Most institutions use fierce animals or symbols of strength; very few have a plant. A seed in flowering plants is always formed within a fruit, which in the case of the Ohio buckeye is large, leathery, and slightly prickly. One to several seeds are formed inside. The tree can be up to 30 feet tall, and the leaves are divided into segments. Leaves and fruits of the Ohio buckeye tree. 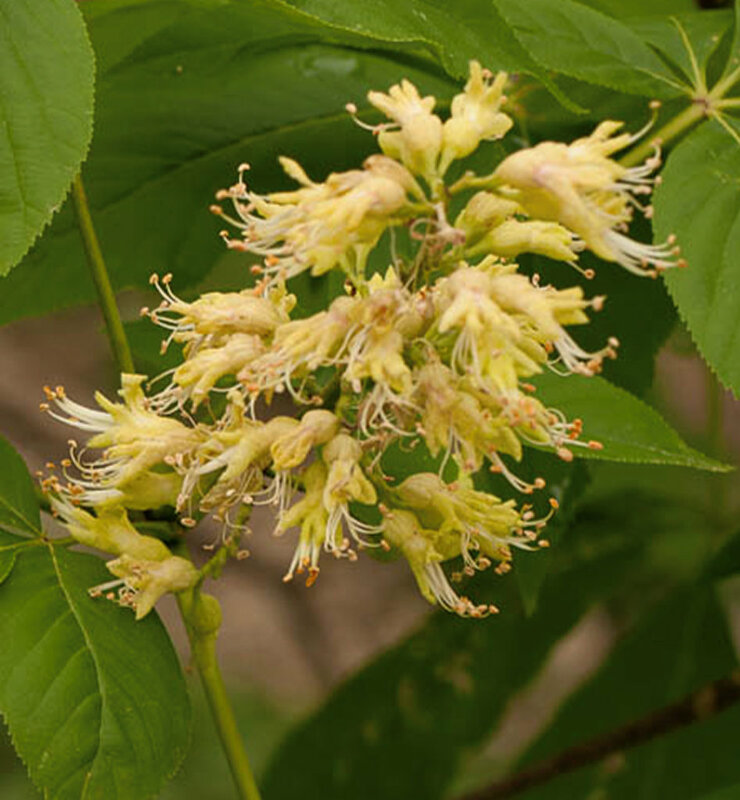 One of the attractive aspects of the buckeye tree is the colorful display of yellow flower clusters (inflorescences) that appears in late Spring throughout the state. The buckeye is used by The Ohio State University as part of the University seal, showing a leaf with two fruits (Fig. 3). 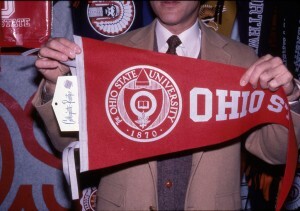 A pennant containing the official seal of The Ohio State University. The Ohio buckeye came into the scientific world as a new species, under the name Aesculus glabra, described by Professor Carl Ludwig Willdenow, Director of the Botanical Garden in Berlin, Germany. Seeds were collected about 1803 from some unknown locality in Ohio or neighboring state and sent to Berlin for germination. It grew successfully in the garden, and when the small tree flowered, a specimen was prepared, with Prof. Willdenow describing it as new to science in 1809. 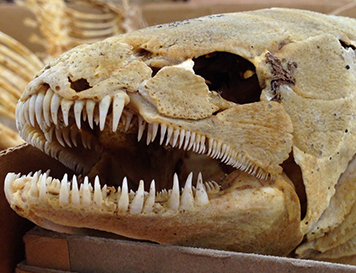 This specimen is called the nomenclatural type (holotype) and is forever associated with its scientific name. In a certain sense, this can be regarded as the original buckeye. 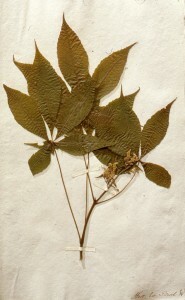 The original specimen (holotype) of Aesculus glabra Willdenow. 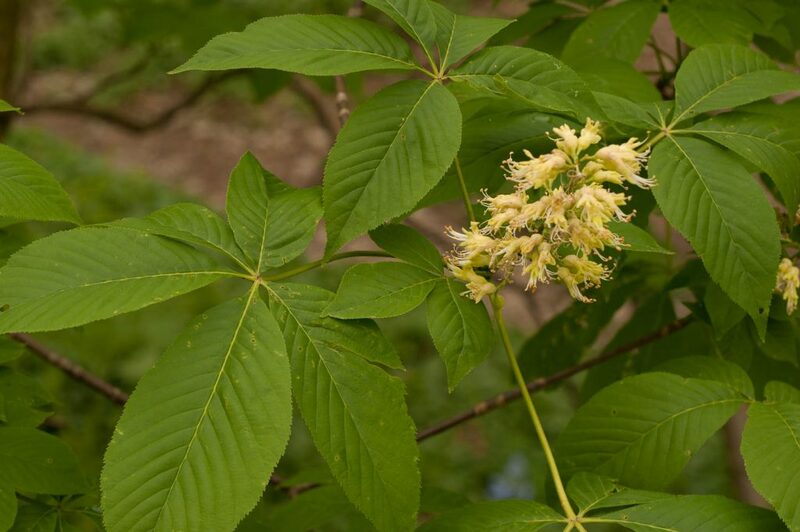 Because of the importance of Aesculus glabra to the state of Ohio and The Ohio State University, a campaign was initiated in 1985 to bring the original buckeye to campus. 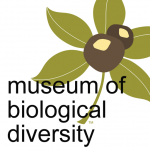 This was not an easy endeavor, because the Berlin Botanical Garden and Museum had never loaned any of the historically important Willdenow specimens to another institution. 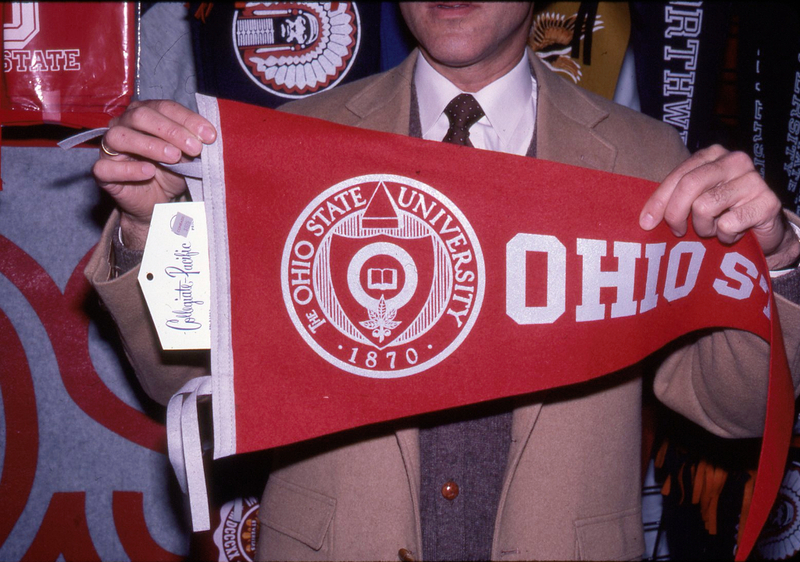 After serious negotiations, and in recognition of the help that the United States had made through the Marshall Plan to reconstruction of Germany after World War II, the holotype of the Ohio buckeye was loaned to Ohio State in the summer of 1987 for several months. It was hand carried from Berlin to Columbus. 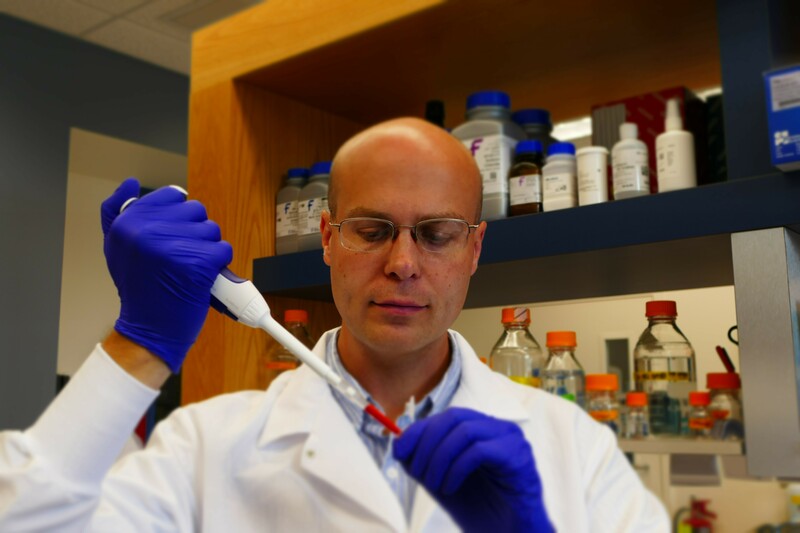 Thanks to financing from the office of the President at OSU, a special mount was made for the specimen, which allowed it to be placed on an easel for display. Housed in the Herbarium of the University, at that time still in the Botany and Zoology building at 12th and Neil Avenue (now Jennings Hall), it was taken on tour to alumni clubs in the state. Most exciting, however, was the presentation of the holotype on 14 November 1987 on the 50-yard line during the Ohio State-University of Iowa home game to the assembled fans. President Jennings formally received the specimen for the University, assisted by me and Prof. Daniel Crawford, the Chair of the Department of Botany. Even Brutus had the opportunity to get to know his scientific origins. Group photo of Daniel Crawford, Brutus, Tod Stuessy, the original buckeye, and OSU cheerleaders in the stadium during the OSU—Iowa football game. Presentation of the original buckeye (holotype) on the 50-yard line during the Ohio State—Iowa football game on 14 November 1987. Left to right: Daniel J. Crawford, Tod F. Stuessy, and President Edward H. Jennings. Different parts of the buckeye tree are used as memorabilia or symbols. Very popular are necklaces made of actual seeds, which can be worn in the stadium to help cheer on the players. Also popular, especially to folks with a sweet-tooth, are the buckeye candies resembling seeds, with peanut butter centers bathed in chocolate. Socks bearing Buckeye symbols from a local souvenir shop. In addition to these obvious symbols, there are countless items in souvenir shops that have images of buckeye seeds and/or leaves, ranging from socks to hats, and including underwear and toilet seats! The football players even receive a buckeye leaf on their helmets, a badge of honor, after completing an outstanding play during the game. The Ohio buckeye, therefore, is an important part of the fiber of life at Ohio State University. It is satisfying that the center of all the attention is a plant. We in the Herbarium are delighted that all members of the university community are continually reminded of the importance of the botanical sciences, especially in the Autumn season during each football game! 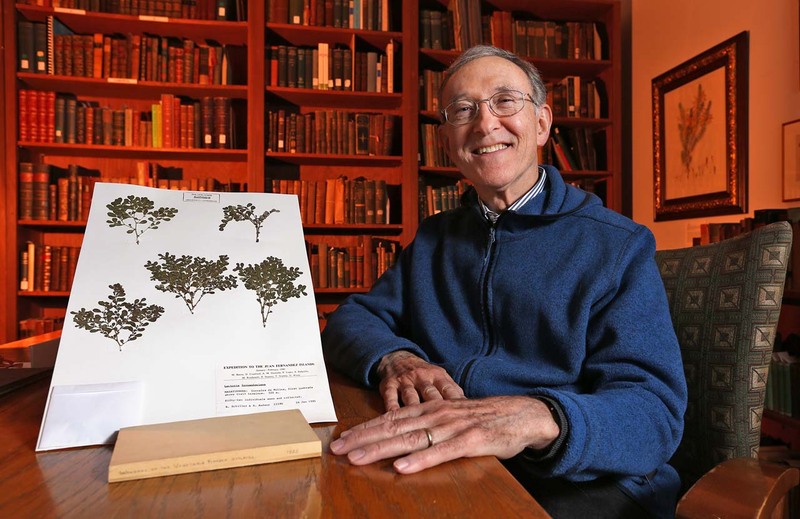 About the Author: Tod F. Stuessy is Professor Emeritus at the OSU Herbarium. You may have read the “impressions” of an OSU student who works in the herbarium on a part-time basis. 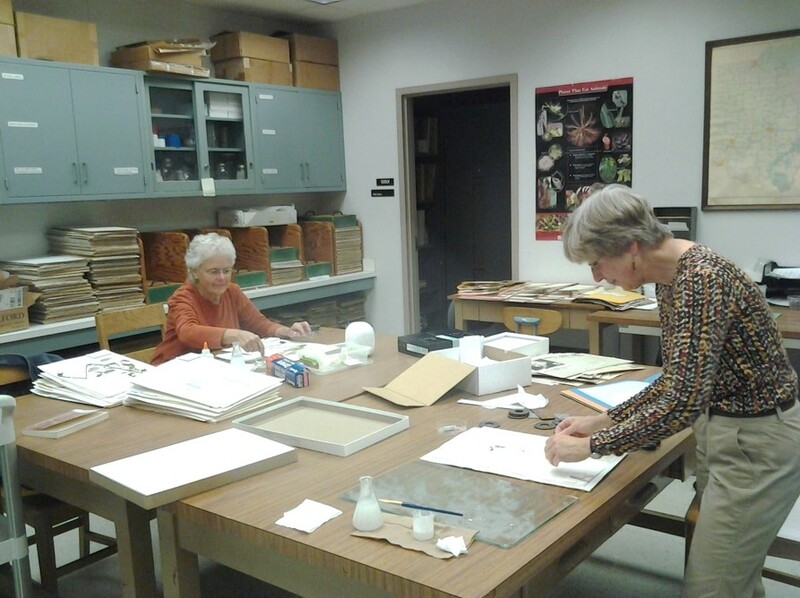 Today, we present the views of two volunteers who have been extremely helpful in the maintenance of The Ohio State University Herbarium. Donna Schenk reflects: “I worked part-time in the herbarium when I joined the work force in 1999 after a 20 year stint as a stay-at-home mom. My interest in plants has lasted my whole life. My family raised hot-house tomatoes in Northeast Ohio and we worked as a family in the greenhouse. After getting a Biology degree in college and marriage, my husband and I had a garden and started seeds each year. 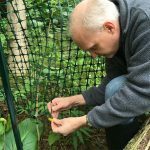 I am also a Life Member of the Herb Society of America, which emphasizes the scientific aspects of plants. So my love of plants is genuine. 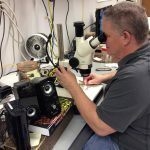 Marty Marlatt‘s story is quite different: “I retired, after almost 34 years, from the Computer Science and Engineering Department at The Ohio State University. I was scouting around for activities to get involved in after retirement when I learned of the Ohio Certified Volunteer Naturalist program. The Dublin Parks and Recreation office was managing the program for Franklin County, so I contacted them and obtained the application form. There were only 20 people selected to participate and I was one of the 20. I was excited as I love all things outdoors! As part of the Naturalist program, we agreed to volunteer for a specified amount of time. 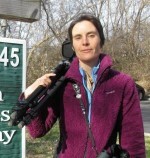 I volunteered several hours mapping locations of bluebird houses for the Dublin Parks and Rec office. My territory was about a third of the Dublin City limits and I was given a map and a handheld GPS to log in the houses I found. But that wasn’t enough hours. I remembered Dr. Wenzel saying the Museum held an open house once a year and they always needed help. So I emailed him. He promptly forwarded my email to Cynthia Dassler, who was in charge of volunteers that year. Cynthia was happy to have me on board and gave me many interesting things to do – mounting skulls, making posters, arranging the exhibit items from Peary’s polar expedition, etc. Cynthia indicated that I did a fine job and if I wanted to further volunteer to contact her. I waited a few weeks and finally emailed Cynthia saying I’d like to come talk about volunteering at the Museum. 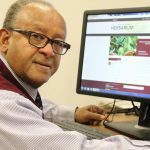 When I arrived, Cynthia introduced me to Mesfin Tadesse and said Mesfin could use help here in the Herbarium or we can find other work for you to do. Mesfin was quick to say “yes, we have many thousands of specimens that need mounted and no one to do it.” That was all it took. 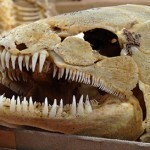 I am a sucker when it comes to people needing help, and thousands of specimens and no one to mount them seemed like a person in serious need! About the Authors: Donna Schenk and Marty Marlatt are long-time volunteers in the herbarium. 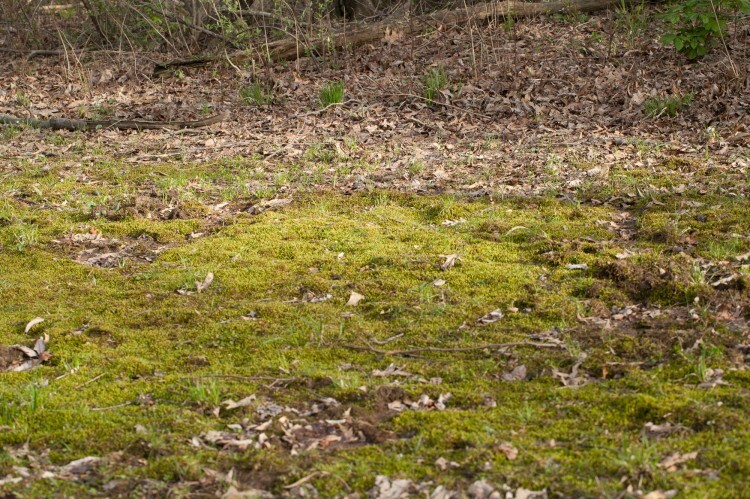 What does it mean to be a moss? Mosses are the most diverse group of bryophytes with a myriad of assorted characters, some which are characteristic of mosses in general and some that differentiate mosses from one another. 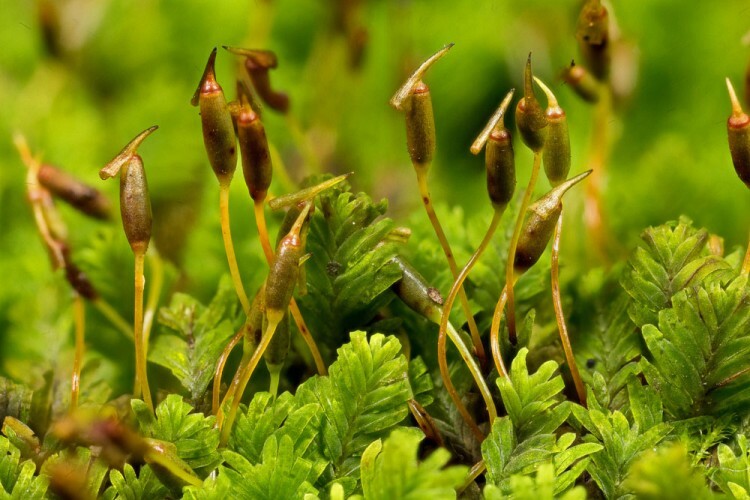 As with all plants, mosses have two stages of their lifecycle, one stage that produces spores, the sporophyte, and one stage that produces gametes (eggs and sperm), the gametophyte. When the sperm fertilizes the eggs, the resulting embryos grow into the sporophyte. Likewise, in a cyclic fashion, spores produced by the sporophyte grow into the gametophyte. 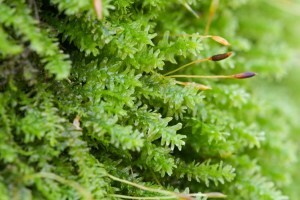 In mosses, the sporophyte is attached to and dependent for food (not green and photosynthetic) upon the green gametophyte. 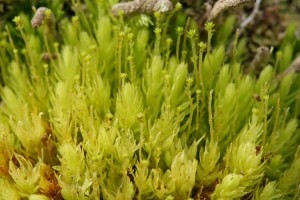 Habitat of the pale plait moss, Calliergonella lindbergii. 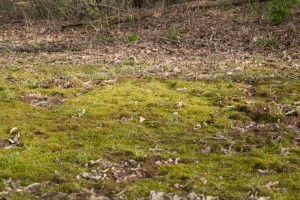 The green mat on the forest floor is gametophyte. 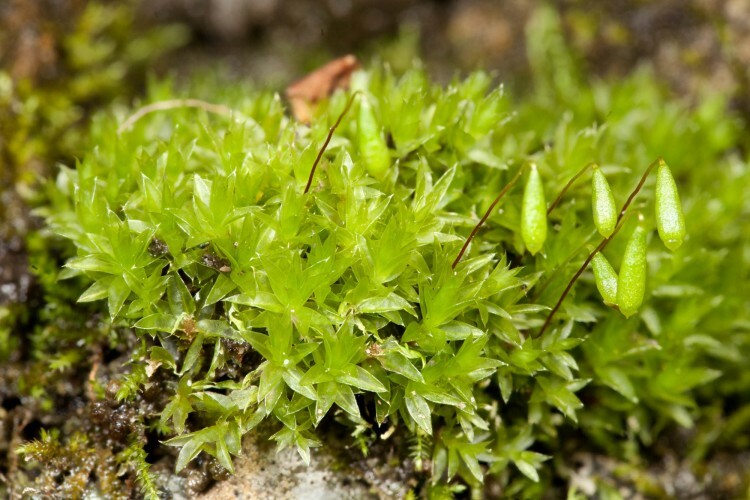 In mosses, the gametophyte is green, has stems and leaves, and is the most noticeable stage of the lifecycle, i.e., the stage that you would generally observe as you take a walk in the woods. 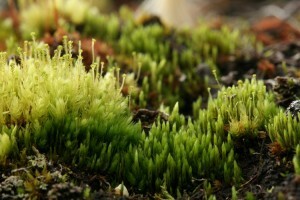 The gametophyte stage is the stage the exhibits poikilohydry, the ability of mosses to dry to surrounding conditions without dying, and then begin metabolic activity when the environment becomes moist. To retain moisture as long as possible, mosses possess characters to prevent water loss. 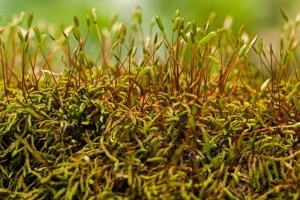 One of the most conspicuous methods that mosses utilize to conserve water is to change the position of their leaves when the plants are dry versus wet. When dry the leaves often curl or press together, or move closer to the stem. With moisture, the leaves become wide spreading, allowing for maximum interception of light for photosynthesis. The change in leaf configuration between wet and dry conditions changes the entire look of the plant. You can imagine the aggregation this causes bryologists. They need to double their recognition skills to identify one moss species! The rounded tongue moss, Anomodon minor, when dry. Note that the leaves are mostly appressed to the stems. 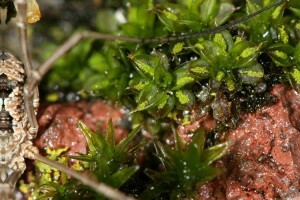 The rounded tongue moss, Anomodon minor, when wet, with leaves spread away from the stems. 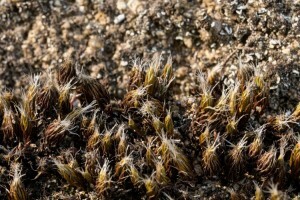 Dry plants of the bristly haircap moss, Polytrichum piliferum, showing leaves that are upright and closely erect with long white hairs at the tips. The white hairs reflect light to help prevent water loss in the plants. Wet plants of the bristly haircap moss, Polytrichum piliferum, showing the leaves widespread. Dry plants of Barbula unguiculata from a limestone fence. Note that the leaves are curled around the stem. Wet plants of Barbula unguiculata. Note that the leaves have uncurled and are spreading. Plants of Bryum caespiticium, an acrocarpous moss. Pleurocarpous plants of the necklace chain moss, Leskea gracilescens. … or pleurocarpous, branching plants that bear sporophytes on side branches. 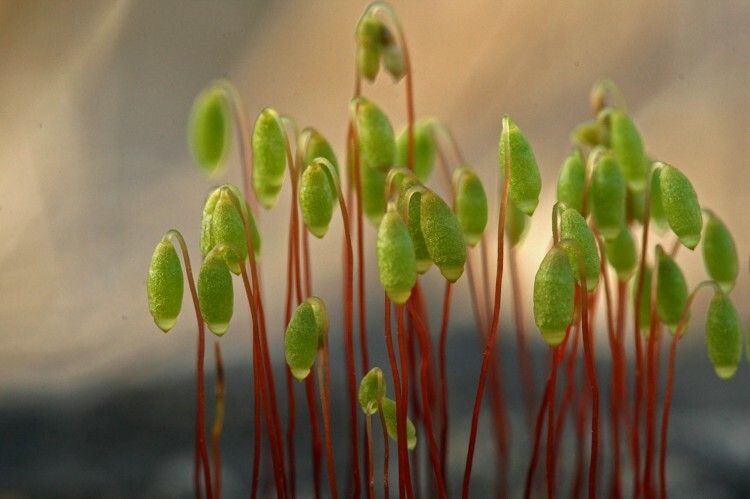 The sporophyte is usually composed of a stalk with a sporangium at the tip. Sporangia are the containers that produce spores, and vary in structural appearance between major groups of plants. In mosses the sporangia are round structures that are usually attached to a stalk, with the stalk attached to the gametophyte. splachnoides, with leafy green gametophytes and sporophytes composed of a brown stalk and sporangium attached. Plants with sporangia of the low bristle moss, Orthotrichum pumilum. Occasionally the stalk is very short or vestigial, causing the sporangia to be nestled within the leaves of the gametophyte. The apex of the sporangium possesses a cap that protects the spores until they are fully developed and ready for dispersal. Underneath the cap is the beautifully intricate part of the moss sporangium, the peristome. 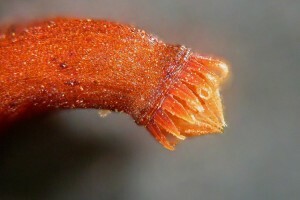 The peristome is a ring of ornamented teeth around the opening of the sporangium that helps to disperse spores into the air stream by curling in and out of the sporangium as the humidity changes. 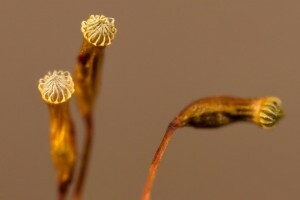 Sporangia of Callicladium haldanianum with the caps still attached. Underneath the caps are the peristome teeth. Peristome teeth of Callicladium haldanianum after the cap has fallen off. Note that the peristome has two layers, the inner layer pointed outward and the outer layer curled inward at the tips. Sporangia of Aulacomnium heterostichum with two rows of peristome teeth at the top. 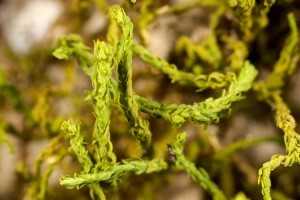 The knothole moss, Anacamptodon splachnoides. 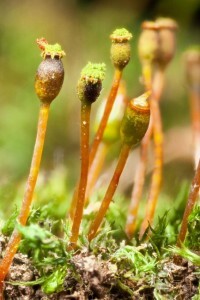 The upright stalks with brown elliptical sporangia releasing green spores. 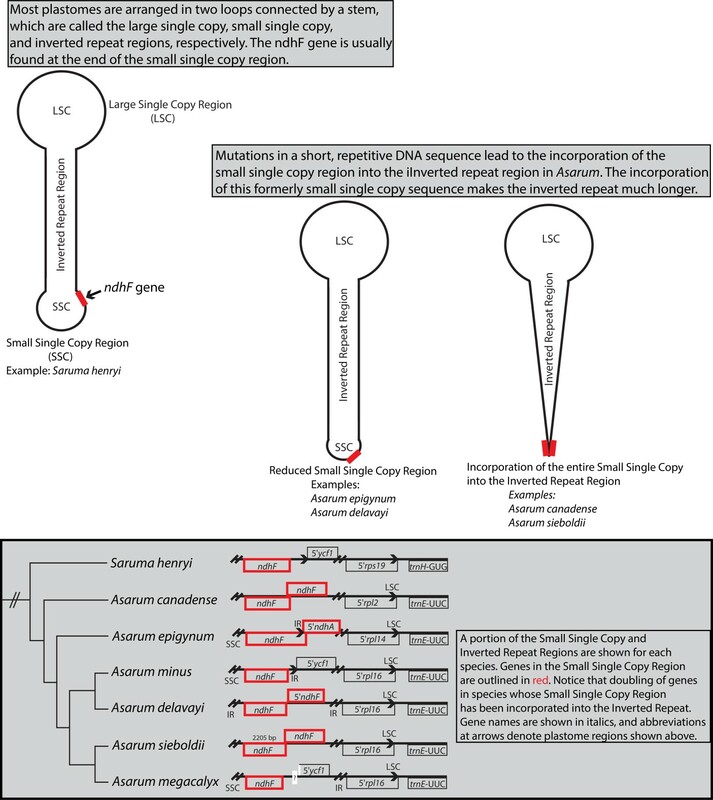 Sexual reproduction in plants, the production of gametes and spores, results in genetic variation in the offspring, but it is not the only means of reproduction in mosses. Asexual reproduction, the production of clonal propagules that are exact copies of either the gametophyte or sporophyte, occasionally occurs on moss gametophytes. Plants of Syntrichia papillosa with clusters of light green asexual propagules in the center of the leaves. 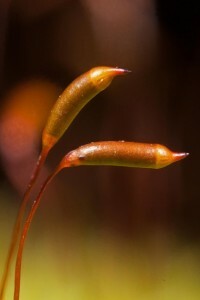 Plants of the ribbed bog moss, Aulacomnium palustre, with stalks that have a group of asexual propagules at the tip. Plants of Tetraphis pellucida showing asexual propagules inside a cup-like formation of leaves. 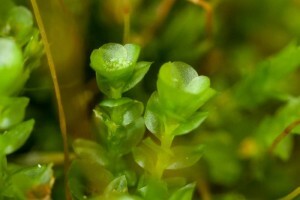 The oil spill moss, Platygyrium repens, produces angular, asexual propagules at the tips of the stems. 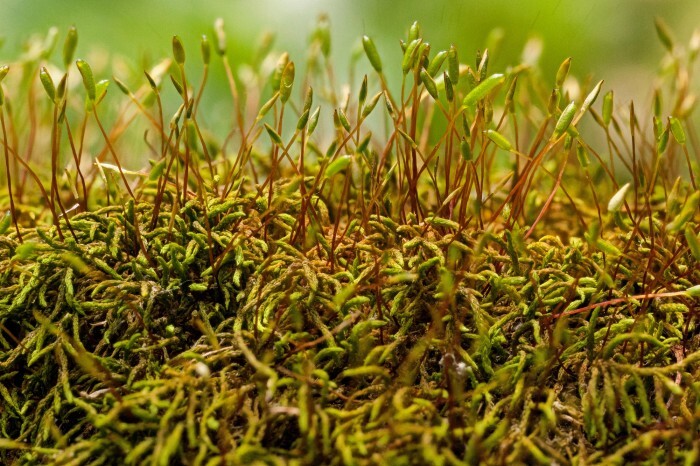 What does it mean to be a moss? Small, intricate, and full of wonderful variation! About the Author: Dr. Cynthia Dassler is Curator of Cryptogams (small plants that produce spores) at The Ohio State Herbarium (OS) in the Department of Evolution, Ecology and Organismal Biology. All photos courtesy of Bob Klips. When told that a herbarium is a collection of plants, most people think of flowering plants or pine trees, or perhaps even ferns. The herbarium possesses these plants, but it also has other plants – an often, overlooked group of plants, the bryophytes that include mosses, liverworts and hornworts. 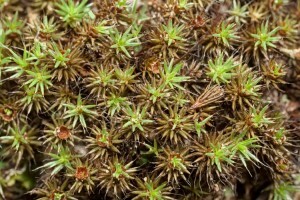 An example of a bryophyte, the ribbed bog moss, Aulacomnium palustre, with stalks of propagules that will be dispersed for asexual reproduction. From a wet meadow at Waldo, Marion County, Ohio. April 21, 2006. Photo by Bob Klips. Bryophytes are small. 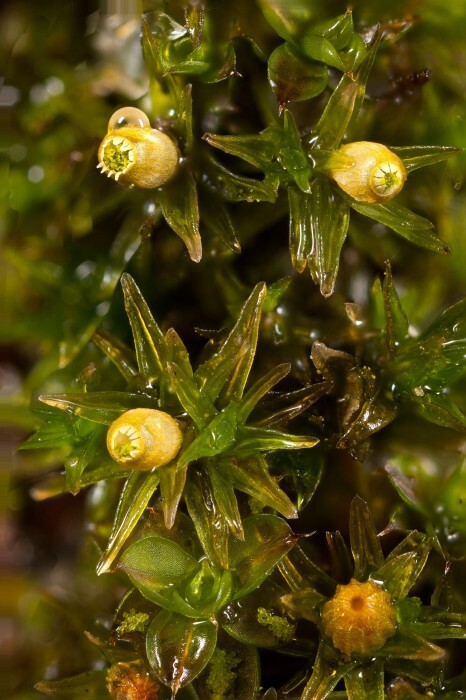 As a result, the characters that distinguish bryophytes are small, microscopically so, but the array of beauty and intricacy displayed in flowering plants also are present in bryophytes. Those researchers that study bryophytes, bryologists, are privileged to observe this vibrant world of miniature plants. An example of the complexity and elegance of the spore-producing structures of the small-mouthed thread moss, Bryum lisae var. cuspidatum, as observed by a bryologist. Alum Creek State Park, Waldo, Marion County. April 17, 2008. Photo by Bob Klips. Bryophytes are small plants and often require the use of dissecting and compound microscopes to view diagnostic characters. 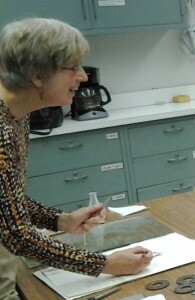 Here bryologist Diane Lucas uses the compound microscope to view the shape and size of the leaf cells of a moss. A leaf of the moss, Bryum flaccidum, showing hexagonal leaf cells. Moss and liverwort leaves are only one cell layer thick, thus each individual leaf cell is easily visible, as seen here viewed with the compound microscope. 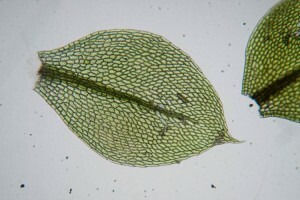 The shape and size of the leaf cells are often used to distinguish moss species. Bryophytes often grow in places where other plants cannot grow, such as on the sides of trees or on the surface of boulders. Bryophytes are able to grow on such substrates because they are able to survive after drying to conditions equal to the water content of the surrounding environment, conditions that would cause wilting and death in other plants. Poikilohydry, this ability to dry and then re-establish growth in the presence of moisture, is a character that flowering plants have evolutionarily lost. 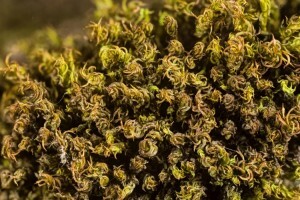 In herbaria, the poikilohydric nature of bryophytes has been observed in some specimens that are able to grow after five, ten or twenty years dried in a herbarium. A typical habitat of the rounded tongue moss, Anomodon minor, on limestone rock. 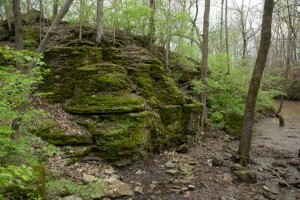 From Duranceaux Park, Delaware County, Ohio. April 24, 2011. Photo by Bob Klips. Bryophyte specimens are easier to collect and to preserve compared to other plants because they do not require pressing, or mounting onto herbarium sheets. 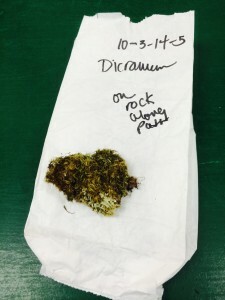 While in the field, bryophyte plants are assigned a collection number and placed into small paper bags or paper envelopes, where they are dried. In the herbarium, bryophytes are stored in envelope packets that are made from 100% cotton rag archival paper. Labels with species identification, collection location, habitat information, collection date and collector are printed onto the face of the envelope. The envelopes are stored in flat boxes specially designed to fit on the shelves of herbarium cabinets. Bryophytes are collected in the field in paper bags or envelopes. 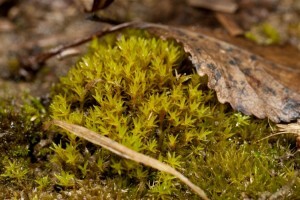 The bag in the photo has a collection number at the top, followed by a tentative field identification and the substrate on which the moss (shown on top of bag) was collected. Typical information on face of a bryophyte packet, in this case, a packet of a moss from Crawford County, Ohio. 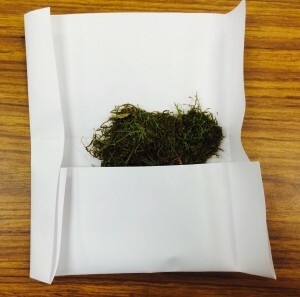 An open packet showing moss plants stored inside. 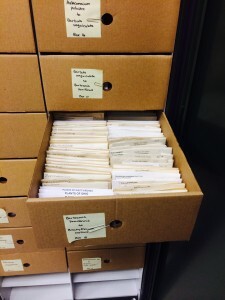 Flat boxes store bryophyte packets inside herbarium cases. 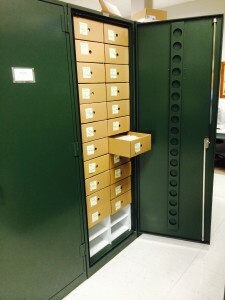 A herbarium case with two rows of boxes that contain packets of bryophyte specimens. 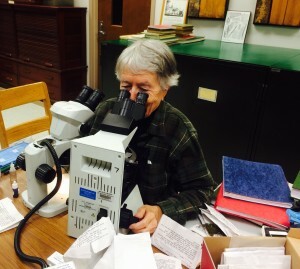 The Ohio State University Herbarium contains over 10,000 specimens of bryophytes – a bryologist’s delight. 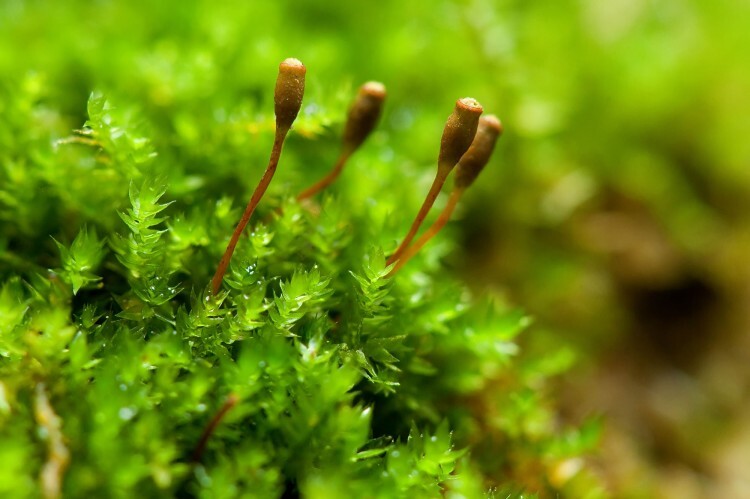 From a bryologist’s point of view – delighting in the world of small plants: the moss, Fissidens subbasilaris, with stalks subtended by oblong sporangia that contain spores. From Christmas Rocks State Nature Preserve, Fairfield County, Ohio. September 7, 2014. Photo by Bob Klips.